Food is life. It’s necessary for our survival, but it’s so much more. Food can cause pleasure, but it can also cause difficulty. If you have a bad diet, it can lead to a myriad of health problems. But can the food you eat lead to hair loss? At RHRLI, we know our patients are concerned about anything that can cause hair loss. It’s why we offer a permanent solution to losing your hair. Our permanent solution is called the ARTAS® system and it uses robotic technology to give our patients the most precise, minimally invasive hair transplant procedure you can find on the market. At RHRLI, we help transform the lives of our patients every day and we’re the only hair loss center on Long Island that has ARTAS®. 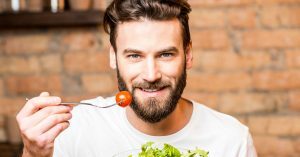 We know our patients want as much information as they can get about their hair loss, so we want to tell you what you should know about the relationship between hair and food. Understanding how diet affects hair loss can be a bit tricky. According to GQ, there have been several studies that show there is a link between diet and thinning hair. In particular, a 2000 Finnish study showed that men with insulin resistance which leads to diabetes and heart disease, are more likely to lose their hair. If you have a diet that’s high in sugar and carbohydrates, you’re at risk to have insulin resistance. “The consensus is that diet influences hair loss.” Dr. David Kingsley, a well-known hair loss expert, told GQ. But that raises the question of whether your diet can reverse the process. A low carb diet won’t cause hair to grow back, but there’s a lot diet can do to prevent hair loss. Some foods that will help minimize hair loss include essential fatty acids, according to WebMD. Foods such as salmon, tuna, mackerel, walnuts, almonds and flaxseed oil which are rich in omega-3 can strengthen hair, skin and nails. Vitamins can also play an important role, Vitamins B6, B12 and folic acid can strengthen hair and some vegetarians and vegans don’t get enough of these vitamins. Bananas, potatoes and spinach are high in B6, while meat, poultry, fish and dairy are good sources of B12. Fresh fruits and vegetables, such as citrus fruits, tomatoes, beans, lentils and whole-grain products are high in folic acid. Finally, protein is critical for healthy hair. So fish, chicken eggs and soy products can boost your hair health in a balanced diet. Some minerals also help to make hair healthy including iron, zinc, biotin and magnesium. Taking a daily vitamin and mineral supplement can be beneficial for healthy hair. If you have questions about keeping your hair healthy, or if you’re seeking a permanent solution for your hair loss, talk to RHRLI about how thinning hair is affecting you. ARTAS® can give you a full, healthy head of hair. To learn more, contact us today.